Angel Falls is the tallest waterfall in the world. The water drops 979 meters (3212 feet) - over 80% of that distance is free fall. I recommend visiting during the heart of the rainy season (June to October) when Angel Falls is in its full strength and glory. 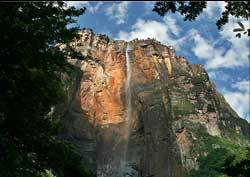 During the core months of the dry season (January to April), the Angel Falls can shrivel to a skinny practical nothing. What water goes over the mountaintop brink usually vaporizes into mist before reaching the ground. Moreover, the low level of the river can make a river trip slow and difficult, if not impossible. On the other hand, there are fewer tourists, prices are lower, and there is less likelihood that the tops of the falls will be hidden by clouds. His name was Jimmie Angel, an American barnstorming, fortune seeking pilot. He "discovered" the falls in his airplane in the 1930s while looking for gold. Local Indians, of course, have known about the falls for millennia. Former Venezuelan President Chavez wanted it called by its native Pemon Indian name: Kerepakupai-Meru.